If you don't see your frequently asked question listed, please contact our Customer Service department for help. Our normal processing time is 2 business days before an order is packed and shipped from WEBS. We do our best to ship within this timeframe, but please feel free to call if you need faster shipping options. We will email a shipping notification once your order ships with any available tracking information. See our Shipping Information page for more details about our shipping process. How can I get expedited shipping for my order? If you need a faster shipping option than our normal processing time of 2 business days, we provide Next Day Air, Second Day Air, and Three Day Air through UPS within the Continental U.S. You can select one of these options during checkout for an additional cost. Expedited orders placed before 1pm ET will be shipped same day. Expedited orders placed after 1pm ET will be shipped the following business day. UPS does not ship on Saturday and Sunday, so orders placed close to the weekend will only be shipped on business days. For example, an order placed on Friday using Next Day Air will be delivered on Monday. If you have a drop-dead date for which you need to receive an order, please contact Customer Service for the most accurate advice on how to ensure that your will receive your order in time. How do I redeem a WEBS Gift Card? To redeem your Gift Card online, simply put the gift card number in the Gift Card Number field when checking out. If you are using multiple cards, put the authorization number from the back of the cards and the gift card values in the Special Instructions box on the Payment & Review page during checkout, and we will apply the balance to your order. Physical WEBS Gift Cards can also be used in the store or on the phone. We accept all major credit cards—Visa, MasterCard, Discover, and American Express. For checks or money orders, please mail them with a list of what you would like to purchase including quantities and prices, and remember to include shipping costs, which can be calculated using our shipping charts. Note that money orders and check orders are held two weeks for bank clearance. We do accept PayPal for online orders too. But we cannot accept PayPal for phone orders. Can I pickup my online order in the Northampton retail store? Please allow 24–36 hours from the time you place the order to be completed and ready for pickup. Orders placed on Friday, Saturday and Sunday will be processed on Monday. When your order is processed and ready to pick up, you will receive a confirmation email. If you call to make a change to your order, it may delay when your order is ready for pickup. As with all orders placed online, your order will be charged when it is filled. A complete invoice will accompany your purchase. Occasionally we will be unable to fill your order with a single dye lot. We will contact you if we have a mixed lot and inform you of the options for completing your order. If an item is backordered, we will pick and charge what we have in stock and contact you when the backordered items arrive. If the item is sold out, we will pick the rest of the order and contact you for substitutions. If you want to do more shopping when you come in to pickup your order, we will add any discounts to your in-store purchase that may apply. Why can’t I find my order listed under Recent Orders or in my Order History? In order to view an order under your Order History, you must be logged into your account when you start the checkout process. Phone orders do not appear in your online Order History. If you have questions about an order placed over the phone or when you weren’t logged into your account, contact customer service and they can help you. If an item shows 0 in stock or you want more than we have in stock, you are able to add the quantity you wish to purchase to your shopping bag. We will backorder this item for you and send it when it is back in stock. We don't charge for backorders until they ship, and most backorders take an average of 2–3 weeks to be back in stock. We will keep your backorder in our system for as long as it takes to receive more stock, unless you choose to cancel it. Read more about backordered products here. Will my yarn order come from the same dye lot? We try to fill all yarn orders with a uniform dye lot. If we don't have the quantity you ordered in a single dye lot, we will contact you to see what you would like to do. If it is a regularly stocked yarn, we can usually backorder the yarn and fill your order when new stock arrives so that the quantity you ordered can be filled from one dye lot. If the yarn is a closeout, or is dyed in small batches, this isn't always possible. How do I request a specific dye lot of yarn? You can place an order with a specific dye lot request in one of 2 ways: either place an order for the yarn through the website and listing the dye lot in the Special Instructions text box on the Payment & Review page during checkout; or call Customer Service and place an order with one of our representatives. If we have your dye lot in stock it will usually ship in 2–3 business days. If we do not, we will contact you. If the website shows that there are 20 in stock of an item, will they all be available in the store? Not necessarily. The inventory levels shown on our website reflect our total inventory between our Easthampton Warehouse and our Northampton Store. If you would like to guarantee the product is available for you in the store, either order through our website and select Store Pickup during checkout, or contact our Customer Service department for assistance. Can I get coned yarn wound off in the store? We no longer offer wind-off service in our retail location. If you need coned yarn wound off, place an order online and choose the Store Pickup shipping option. Include the wind-off quantity in the Special Instructions box—minimum wind off is a 1/2 pound. Please allow 24–36 hours from the time you place the order for it to be completed and ready for pickup. Orders placed on Friday, Saturday and Sunday will be processed on Monday. When your order is processed and ready to pick up, you will receive a confirmation phone call or email. Find more information about Store Pickup on our Shipping Information page. Please see our Return Policy page here. Why can't I download the PDF pattern I purchased? Prior to purchasing any digital pattern, you must first sign into your account or create an account. Either of these can be done through our Log In page. If you are still having difficulty accessing your digital pattern, contact Customer Service for help. You can access digital patterns you’ve purchased through your Pattern Library, which you can find on the My Account page. There is no expiration time for downloading digital patterns. What are the WEBS discounts? When you spend $60 on discountable items, you save 20% on those items. When you spend $120 on discountable items, you save 25% on those items. What is a discountable item? Any yarn or book (not including pattern booklets) at full retail price qualifies as discountable. Patterns, needles, notions, hooks, and other accessories are not discountable. Sale yarns and yarns marked with a "Closeout" tag are also not discountable. Still not sure whether an item qualifies for the discount? Look for the WEBS discountable tag on the product page! How do the WEBS discounts compare to free shipping? A lot of people ask about free shipping, but in most cases, our discount will save you more than free shipping does! Let's say you're buying a yarn that costs $20.99 per skein and that you live in UPS zone 8, since it's the farthest from us. The shipping would cost $6.50. 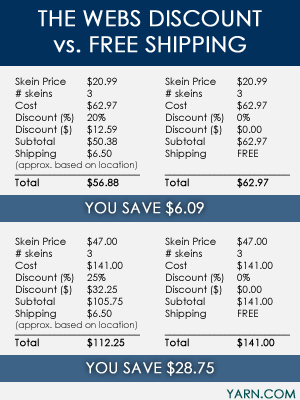 So without the discount and with free shipping, those three skeins of yarn would cost you $62.97. With the discount, however, your total is $56.88, so you're still saving $6.09 on the three skeins! Because of our great yarn and book discounts, we rarely offer promo codes. We do have many promotions for free gifts or free digital patterns with yarn purchases. You can see a list of these on our Special Promotions page. What are Deals of the Week? Each Tuesday new Deals of the Week are posted on our website. No promo code is necessary. Each deal starts at 12:00am ET on Tuesday and ends 11:59pm ET on Monday. Deals are in-stock only, no further discount. How do I get onto the WEBS mailing list or request a catalog? If you have purchased from us in the past 12 months, you are automatically on our mailing list. As long as you continue to purchase from us once per year, you will remain on the list. If you haven't purchased from us in the past year but would like to receive our print catalog, you can fill out our Catalog Request form or contact Customer Service and request a catalog. You will continue to receive mailings and catalogs for the next 12 months. In order to remain active on our list beyond 12 months, you will need to make a purchase one time during the year. How do I stop receiving your print catalogs? Contact Customer Service and they can remove you from our catalog mailing list. If you no longer want to receive our marketing emails, click the link at the bottom of our Preference Center page. Be aware that you cannot unsubscribe from our transactional emails such as Order Confirmation, Shipping Confirmation, and emails to write a review of purchased products. Does WEBS have a retail store and when is it open? Yes, our retail store and 21,000-square-foot warehouse are open to shoppers. We're located at 75 Service Center Rd. in Northampton, Massachusetts. WEBS is open Monday–Wednesday, Friday 10:00am–6:00pm, Saturday 10:00am–5:30pm and Thursday evenings until 8:00pm. We are closed on Sundays and on New Year's Day, Memorial Day, July 4th, Labor Day, Thanksgiving and Christmas Day. Can I visit WEBS with a group? If you are planning to visit WEBS as a group with 6 or more people, please contact our Store Manager Bonnie with as much advance notice as possible and let her know when you are coming. You can reach Bonnie at blemme@yarn.com or call 1-800-FOR-WEBS. I'm interested in designing for Valley Yarns. Who do I contact? Valley Yarns is always willing to consider adding strong and interesting new designs to our line of patterns. Please contact ValleyYarnsDesigns@yarn.com to find out if there are currently any open calls.